Holidays at Starbucks means that my favorite pastry is back for sale. 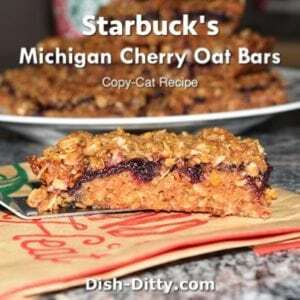 Starbucks Michigan Cherry Oat Bars are my all-time favorite and now I can make them at home anytime with my Copy Cat Recipe. 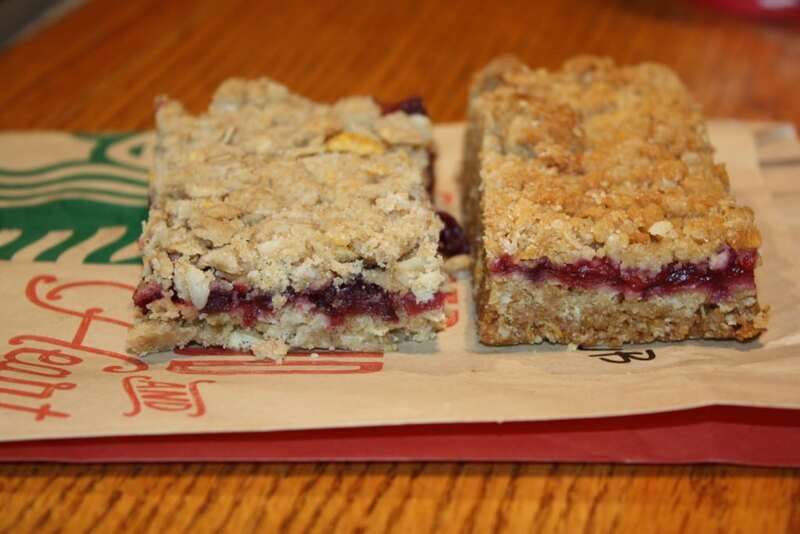 I have spent the summer wondering why Starbucks doesn’t serve these Michigan Cherry Oat Bars year round. They aren’t necessarily a winter dessert. I’m assuming they are popular since they are simply scrumptious. I mean really, they are addicting. Wait no more as you can make these bars at home anytime of the year. And just in time for my birthday (which is today! yay!). In order to spare you the pain of scrolling past my long diatribe, I’ll put the copy cat recipe up top. Feel free to read my story of the trials and tribulations that I went through to create this recipe. 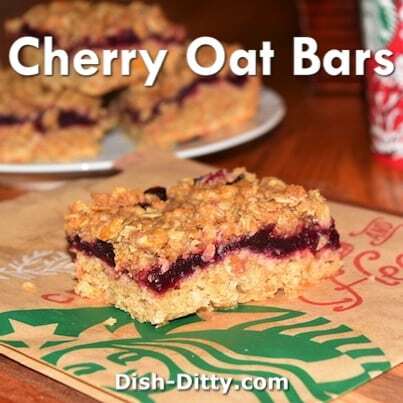 Also, I’ve posted another version of Cherry Oat Bars (my third try) that I think was actually the best of the batch, it even may be better than Starbuck’s version. Make the filling by placing the frozen cherries, granulated sugar, cornstarch and lemon juice in a medium pot. Cook on medium heat and smash cherries with a potato masher. Cook, stirring constantly until mixture is thick and bubbly. Remove from heat and set aside. Using a food processor, pulse the oats and cornflakes for the base and place in a medium bowl (bowl #1) . Then, using the food processor again, pulse the oats and cornflakes for the topping. and place in a medium bowl (bowl #2). You are looking for the flakes and oats to have a little bit of powder and most of the flakes to be reduced in size. To make the base, add to bowl #1 the following ingredients listed under Base: flour, baking powder and salt. Set aside. In a mixer, cream the butter with the brown sugar. Add the egg and vanilla and mix on medium until light and creamy (just a minute or two). Add the dry ingredients and mix until well combined. The mixture will be thick. Spread the base evenly on a greased 9x13 glass pan. Spread the filling onto the base and then move to the next step to make the Topping. Combine all the topping dry ingredients together, and stir to distribute. Add the butter and, mixing with your hand or paddle, combine until the dry ingredients are mixed with the butter and the topping is crumbly. Add topping evenly on top of the filling. Bake at 350 degrees for 20-30 minutes, or until fully cooked and topping is a caramel brown color. I am using a convection oven, and it was done at around 23 minutes. Remove from the oven and let fully cool before cutting into bars. I searched and searched the internet for a good copy cat recipe of Starbuck’s Michigan Cherry Oat Bars. I found two that sounded promising, but each one had elements that I liked and elements I disliked. I’ll start with the one from A Dash of Sanity. 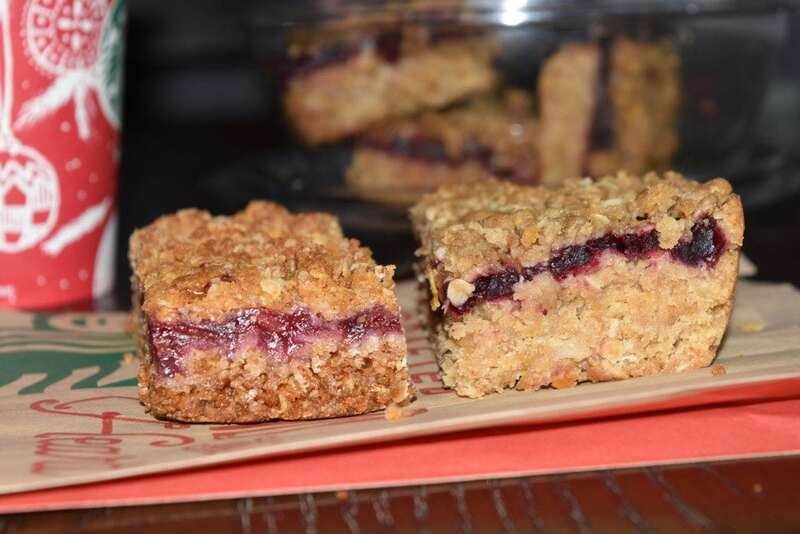 The bars sounded ok, but I really felt like there was more to the recipe than oats and flour. The filling, however, sounded spot on. My only issue with the filling there was that it required fresh cherries, which are only in season for a short period each year. And even when in season, the type of cherries may not be quite right. So, I scratched the pastry part of this recipe and used the filling as a base for my recipe. Next I got the bar portion of the recipe from Rumbly Tumbly. I pretty much used that portion of the recipe as is since it sounded just perfect. The filling however? Using cherry pie filling then adding more sugar? Yikes! I think my blood sugar would definitely spike if I did that. Not to mention that it is a bit soupy. So, I made my first batch with the filling from A Dash of Sanity, using frozen cherries instead of fresh, and using the crust and crumble recipe from Rumbly Tumbly. Try 1 was delicious! But, the bottom wasn’t quite right. 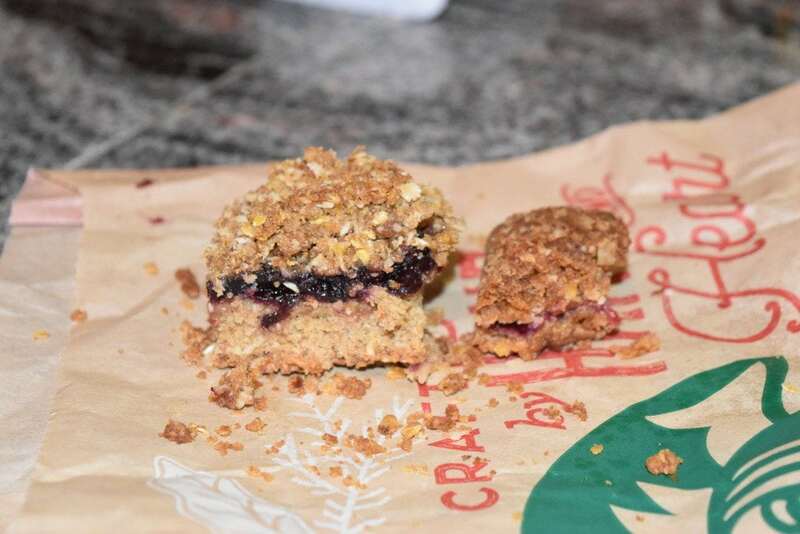 It was too crumbly. 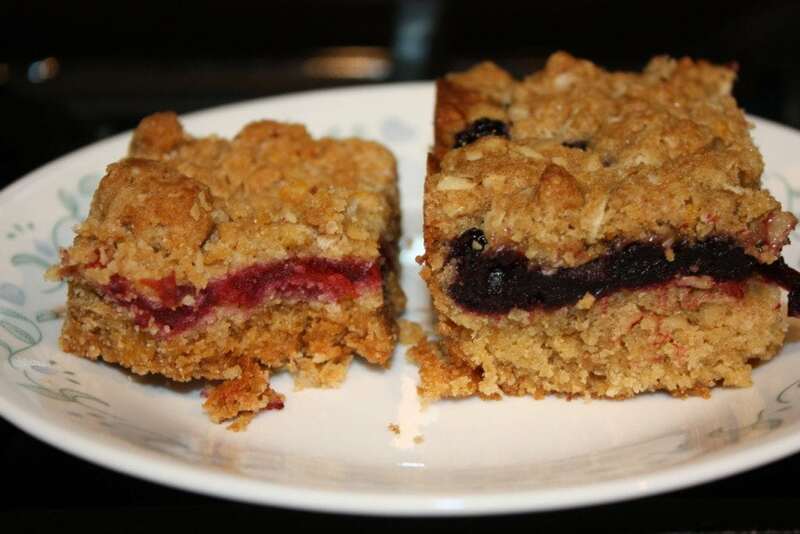 oat streusel [enriched flour, tart cherries (cherries, sugar), butter, fructose, egg, modified corn starch, tapioca dextrin, pectin, vanilla extract, color (vegetable juice), soy lecithin. So, I decided to make a few adjustments. I started by splitting up the topping and adding 2 eggs to the bottom layer and extra butter and brown sugar to the top. That was closer. It looked and tasted too caky on the bottom (too many eggs maybe), and the top wasn’t crumbly enough (too much butter). And a second look at the ingredients shows both sugar and brown sugar. So, I think the bottom is a mix of brown and granulated and the top is all brown sugar. I also think there needs to be more oats. In addition, between try 1 and try 2, I went from having frozen tart cherries to the dark sweet cherries (it’s what I had). 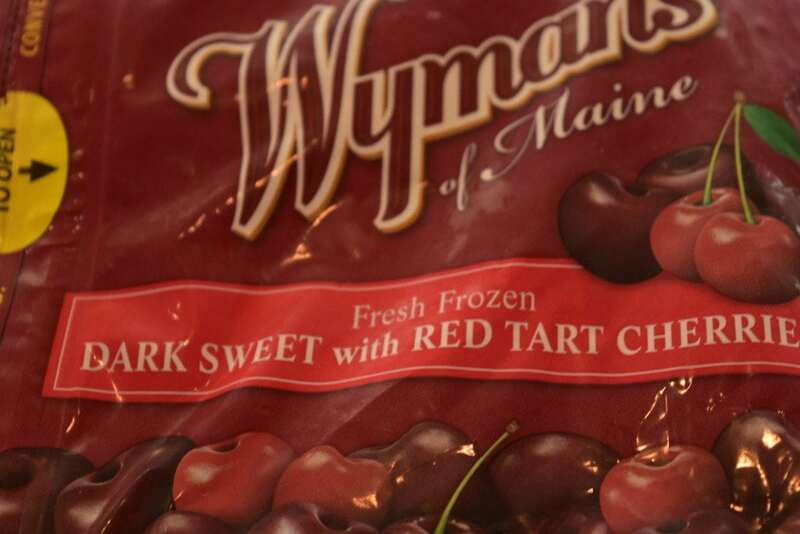 So I need to go back to the tart frozen cherries on my next try. So, my third batch seemed like it would work well. I adjusted down the eggs, I created measured the topping separate from the cookie base, to try and come up with the exact amounts for both the base and top. Mine on the right, Starbuck’s on the left. Using a food processor, add 1 cup cornflakes and 1 1/2 cup rolled oats and pulse about 5-6 times, or until the cornflakes and oats are smaller and not whole. Remove and add to this mixture 1 1/4 cup flour, 1 tsp baking powder and 1 tsp salt. Set aside. This will be your dry ingredients for your cookie base. Using a food processor, add 3/4 cup cornflakes and 3/4 cup rolled oats and pulse about 5-6 times, or until the cornflakes and oats are smaller and not whole. Remove and add to this mixture 1/4 cup flour, 1/2 cup brown sugar and 1/2 tsp salt. Set aside. This will be your dry ingredients for your topping. In a mixer, cream 1 cup butter and 1 cup sugar. Add 1 egg and 1 tsp vanilla and beat for 1 minute. Add the flour mixture from step 3 above for the cookie base. Mix until well combined. Press into a greased glass 9x13 pan. Spread the cherry topping evenly onto the cookie base. Using the flour mixture from step 4 above for the topping, add 1/2 cup of butter. Using your hands or a pastry cutter, combine until all the flour mixture and butter are combined and crumbly. Drop onto the cherry mixture as evenly as you can, trying to cover up the cherries. Bake in the middle of the oven at 350 degrees for 28-32 minutes. The top should start to become golden brown. Remove from heat and let cool completely before slicing into bars. Now on to my 4th try. Big time FAIL! Well, my son liked it, but at this point, I think he’s addicted to any version of a Cherry Oat Bar. I had reduced the butter on the base, measured after I ground the cornflakes and oats. So dry. But, the color was pretty good. 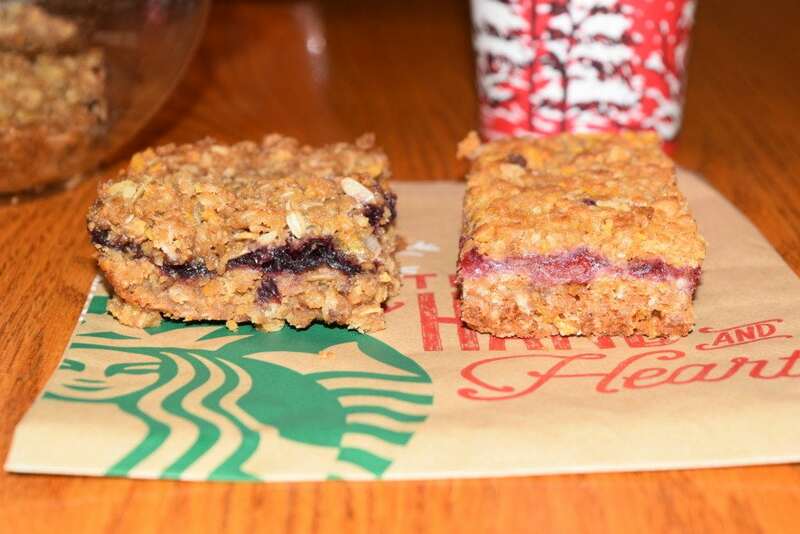 I apologize for the decimated Starbuck’s oat bar. They had only one at the store, and I got it for pictures, but my son (and I) dug into it on our ride home. 4th attempt: mine on the left, Starbuck’s on the right. And then the 5th and final try, regardless of it’s success. I decided either I was going to get it right (or closer) to match Starbuck’s version, or my 3rd attempt would be the final version. I changed my measurements back to be pre-crushed for the oats and corn flakes, adjusted the flour, kept the butter at the lower amount, and some other minor adjustments like reducing the baking powder to reduce the rise. It’s a WINNER! You can see the size and ratio’s are pretty close now, no longer is mine 2x as tall (which I actually like, hence recipe #3 posted above). 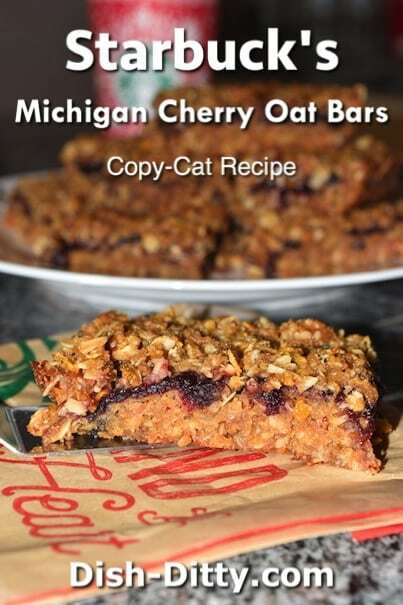 I’m so excited to make one that finally tastes super close to Starbuck’s Michigan Cherry Oat Bars. And, if you ask others, it is even better. I can tell you why too. Take a look at the ingredients again. They use Fructose which is not the healthiest of ingredients to use. Between that and the mass production, anything you make at home with real ingredients will be 100x better. I was able to find these cherries at my local grocery store that had a mix of Tart cherries and Dark Sweet Cherries. It was better than the Costco version that was 100% dark sweet cherries. The tartness of the bright red cherries does help the flavor. I think that’s all for now. My next version of this will be Gluten-Free, Dairy-Free and Free of Refined Sugars. Let’s hope I can get a reasonable facsimile of this recipe that is somewhat healthy. If you’ve gotten this far, thank you for reading! I hope you have as much fun with this recipe as I have had. Enjoy! 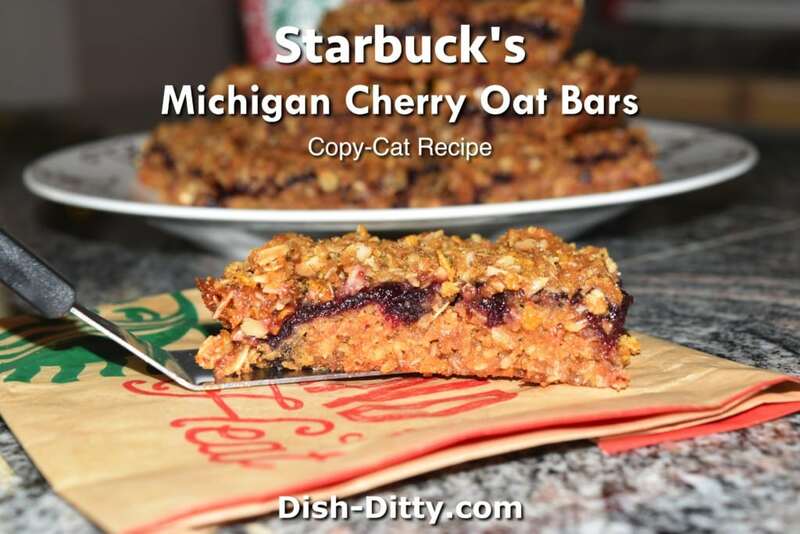 6 Replies to "Starbucks Michigan Cherry Oat Bars Recipe(Copy Cat)"
Hey there, I’m about ready to go try this out — Michigan Cherry Bars are my faves @ Starbx, warmed up . . . so no more leaving the homefront. Will have them tonight for “Oscar’s Greatest Night”. Not sure on champagne or a good cup o’ joe. Grace o’ my thanks to you and your son for tryings and tryings and natch, taste testings. I hope you love it. Enjoy! I was thinking doing this but I was going mix dried tart cherries with frozen cherries the texture might come a little closer yet on the filling. Just a suggestion. Hi Audrey… I put the final recipe actually at the top of the article, I’ll add it to the bottom just in case people are confused. Let me know how that works with the dried tart cherries. Just a note. The cherries in Rumbly Tumbly’s recipe is not cherry pie filling with added sugar. It uses canned tart cherries in water. There is even a picture of the can.